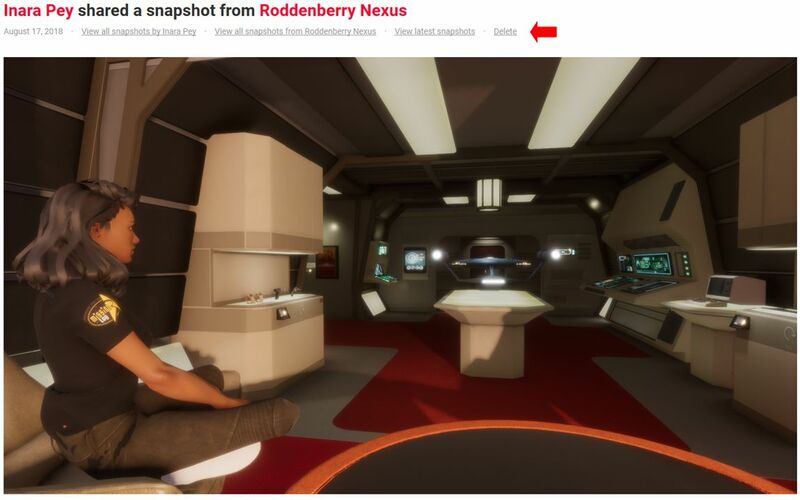 Thursday, July 16th saw the release of the Sansar Script, Snapshot and Share update. After the extensive updates in the July release, this is a more modest update, with a focus on what the Lab refers to a “quality of life” improvements – focusing on user-related capabilities, notably for creators. This article highlights some of the more visible new features and updates with the release. As always, full details of the updates in the new release are available in the release notes. In addition, these notes also include comments from the August 16th, 2018 Product Meeting, which preceded the release. Boden was attending the meeting, together with Aleks and Zaius. Their voices, along with that of Community Manager Eliot, can be heard in the audio extracts included below. To jump directly to information on the upcoming Edit Server changes click here. This release follows in the footsteps of the web Events on the Sansar website, allowing you to add your events to your local Sansar calendar, which also has its own tab within the Events panel. Within the client, either while displaying the Atlas or within an experience, click on the Events calendar icon in the top right set of icons. This will open the Events panel (note: you can also get to the Events panel via the open Atlas and clicking Featured > View All Events). The Events panel, which now comprises just two tabs: All Events and My Calendar (which replaces the My Events tab). To add an event to your Sansar calendar, click on the Add To Calendar button. Events you have created and are hosting, if you have created any. Upcoming events you’ve added to your calendar (if any). Those events you’ve recorded / attended in the past. Listed upcoming / past events include a Remove From Calendar button, allowing your list to be managed. Events added to your Sansar calendar will also appear on the web version of the your calendar and vice-versa (a refresh of either will be required if both are open at the same time when adding / removing events from one or the other). There is currently no ability to add events from the client to external calendars (Google, Apple, Outlook, Yahoo) as you can via the Sansar web site. This will hopefully be in a future update. Upload it to your profile on the web. Open a tab in your default web browser and display the snapshot. View all of your snapshots. View all snapshots of the Experience featured in a given picture. View the latest snapshots uploaded by anyone. Delete the snapshot you are displaying (your own snapshots only). Report a snapshot (only available when viewing snapshots uploaded by others). The options are listed above an image when viewing them in your browser, and are arrowed in the image above. You can also obviously share the image URL if you wish. You can view other people’s snapshots directly from their web profile. So, if you click on the name of an experience creator, or on the name of a friend in your Friends list, for example, you can view their snapshots alongside of their published experiences and current store listings (if they have any of either of the latter). Clicking on a snapshot will display it in its own page, with the options described above. Snapshots to profiles can currently only be viewed on the web, they cannot be seen when viewing profiles from within the client. There is no ability to caption a snapshot with a description. This is intentional on part of the Lab, although it may be reconsidered in the future. In the future, snapshots will be appended to the web pages for experiences as well, whether uploaded by the experience creator or anyone else (however, the experience creator will be able to moderate which snapshots remain displayed on their experience page. This is why the ability to include descriptions in uploaded snapshots has been excluded; it is felt that there is too much risk of people leaving inappropriate descriptions with images, giving experience creators a moderation headache. This option is ready to go, but will be turned on once the necessary moderation tools are in place for experience creators to manage snapshots shared to their experiences. However, a future update to the capability will include the ability to tag snapshots, making them searchable. Adding date and time to snapshots when captured. Auto-generating sequential file names for snapshots taken in sequence, rather than each one having to be manually named. Possible offering a broader range of saved file formats (e.g. TGA, JPG, etc). One thing that is being considered is the option to take a series of snapshots and have them “held” during a session, allowing the user to then go through them and select which ones they want to actually upload to their profile and discard the rest. Reports are generated via Scene Toolbar > About This Scene > Generate Report > Set the destination location on your computer > Save. This release allows creators to create point lighting (e.g. colour, intensity, animation) in their preferred editing tool and then import them directly into the scenes as .FBX files. Once in Sansar, the properties for these lights can still be edited when the .FBX file is within a scene. Locking persistence: objects locked within a scene when editing will now remain locked between Edit mode sessions. Rename a scene object’s name: the name fields for various scene objects have been removed from the properties panel, with the Rename option moved to the scene objects panel. Toggle visibility per object: it is now possible to toggle an object’s visibility in a scene. Toggle selectability per object: the ability to select an object within a scene can now be disabled or enabled. This allows for easier selection of objects which may be layered behind others, etc (e.g. lighting within an object). Trigger Volume filter: it is now possible to now filter by trigger volumes. Currently this does not include any form of parameter to allow spawned objects to decay, but does include the ability to remove the last or all spawned objects. It includes the ability to cap how many items can be spawned in a given time. Objects are spawned as the are imported into the script. So a dynamic object imported into the script will spawn as a dynamic object, for example. – the Greenwall VR experience utilises the SimpleMedia script on their media board. SimpleObjectReset to reset an object’s position. Additionally, the SimpleCollision script has been revamped to better handle Trigger Volumes. New Base Script Class: ObjectScript. In anticipation of rezzable scripts (not yet enabled), this base class only has access to ScenePublic and a maximum of 10 parameters. SceneObjectScript scripts will not run on rezzed content; ObjectScript scripts can run on scene content or rezzable content. Parameters limit for scene objects increased from 10 to 20 parameters. ObjectPrivate.AddInteraction: an Interaction to an object dynamically. Used to add Interactions to rezzed objects or when it isn’t desired that the Interaction prompt be a script parameter. SimpleScript base class deprecated. Not to be confused with the new Simple Scripts. Scripts that use this base class will still compile with a warning. Support for new compiles will be disabled in a future release. It is now possible to browse the Sansar Store using the two new top-level categories of Avatar Looks and Scene Creation, with the sub-categories defined accordingly. Due to appear in a point release between the August (R24) and September (R25) updates is the Edit Server release. This moves scene editing from within the Sansar Client (and local) to being server-based. It means that when editing a scene for the first time, there will be a delay in accessing Edit mode and the scene being edited as the Edit Server instance is spun-up. The reason for this change is to pave the way for a range of new capabilities in Sansar, most notably in relation to the platform’s upcoming licensing / permissions / supply chain system. Moving the Edit capabilities server-side allow the Lab to incorporate the ability to check the licenses associated with all of the objects within a scene and verify what can / cannot be done with them (e.g. is an object / script modifiable? Can it be incorporated into objects intended for sale? etc). The initial benefit of this is that it will allow creators to build complex objects in a scene and then export them as a single object back to inventory (so a car is complete with its wheels, engine, seats, etc. ), rather than these all being individual objects), allowing the composite object to be sold. Additionally, this will enable the licensing / permissions / supply chain system of Sansar’s economy, so that duly licensed objects by other creators can be used within an individual’s own creations, which can then be saved to inventory and sold through the Sansar Store. The first elements of the licensing / permissions / supply chain system is due to start deployment in upcoming releases following the switch to using the Edit Server. Beyond this, the move may in the future allow for things like creators being able to work collaboratively within the same scene. Next Post All change at Holly Kai Park – again!